I mentioned in the previous post that we draw our water from the Lake rather than a well. This presents an additional risk from thing that grow in lakes - in particular I was concerned about bacteria and viruses including chlorine resistant cysts such as Cryptosporidium and Giardia - no beaver fever for me!. 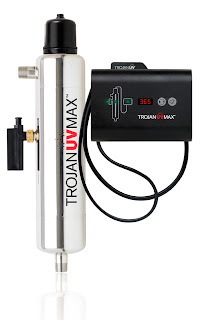 After a bit of a Internet search I settled on the systems manufactured by Trojan, built right here in Canada. In particular I purchased the TrojanUVMax D4. The folks at Trojan have a great selector tool for determining which of their models fit your specific needs. Safety cap prevents children from accessing the lamp or electrical components. It also prevents the lamp plug from accidentally being disconnected. Lamp plug design ensures that no one can power the UV lamp if it's not in the UV chamber. This prevents damage to eyes and skin from UV light.